The hotel is getting stronger. It wants to hurt all of us. I have to admit to having an interest in The Shiningbecause of the setting being positioned on the outskirts of Rocky Mountain National Park. This is a place near and dear to me, one which I've visited many times. 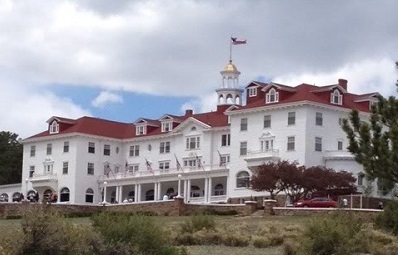 The world famous Stanley Hotel, where Stephen King drew inspiration to write The Shining, and was later used on film for the lesser-known mini-series (not the movie). I took that picture on my last visit to Estes Park. We opted out of staying there, and instead stayed at a nice lodge with a private hot tub. But I do wish we'd gone on the Stanley's ghost tour. Now, I really want to go, just to see room 217, which is where King himself stayed. Back to the book. This might be one of the only times where I won't complain about the side-musings of characters. It's a lot easier to go along for the ride when you can picture the descriptions in your head. I do think that parts were muddied along the way (and I get that this was the way he chose to tell it, but still...), when it became hard to tell what was real and what was supernatural, but eventually the dots were connected, so I came away from my read knowing the gist of how it all went down. The Shining wasn't as creepy up-front as I'd been expecting. But the last 50 or so pages had me glued to my reader. When everything hit, it hit big. The build was slow (although still interesting in its own right), but when we got to where we needed to go, I was unable to stop reading. The characters were a strange lot. I found myself only liking one character out of the entire bunch and that was Danny. At least he wasn't some form of Damien from The Omen. "Danny, how would you know that?" "I don't know," Danny said weakly. 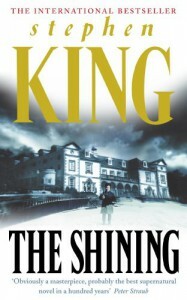 "The shining, I guess." Jack was creepy all around, regardless of where his state of mind was - even before he went to the hotel. Wendy was lost in herself and couldn't be bothered to do what was best for her family. So I clung to the sections featuring Danny because his character was the one I was most anxious for. I wanted him to come out of this ordeal unscathed. The upcoming second book of this duo is about Danny, so I am super excited to read it! My buddy reading friend informed me that the mini-series is closer to the book than the movie was (and I'd only seen the movie), so I will have to track that down sometime.